Recently, I decided that I no longer had any excuse not to take the train into downtown Los Angeles. My goal was to walk around the area and to pop into several art galleries. I had hoped to write a post containing several of my patented mini-reviews. Alas, many of the galleries were closed and my plans were dashed. Luckily, I had the good fortune of being able to walk into the Jennifer Main Gallery (and store), located at 617 South Grand Avenue (her website is located here). It was impossible to miss her artwork through the glass windows at the front of the gallery. Main's art is best characterized as "Chagall meets Picasso." The works on display and for sale, which included not only paintings but shirts, prints, purses, vases, and other miscellany, all were lush and vibrantly colored. She depicts mainly abstracted human figures with all the robustness of Mexican figure painting. 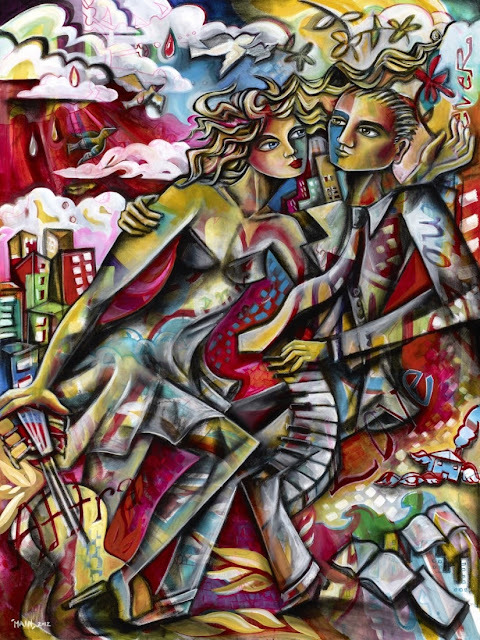 Her works often center around themes of love and romance, with brightly colored couples in various poses and embraces. The most effective paintings in the gallery/store are, to my mind, the more spare and quiet ones. 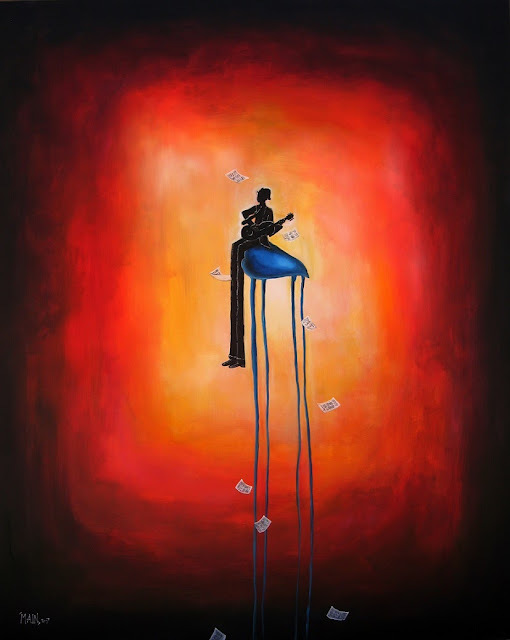 For example, the painting "Life Song", painted in 2006, has a wonderful air of melancholy and loneliness due to the isolation of the simply painted central figure (reproduced below). I was fortunate enough to have the opportunity to conduct an interview with her via email. Please enjoy! Jennifer Main: I always enjoyed drawing and creating art as a kid and as I got to Jr. High it became more of a true passion when I got into an art class where I could learn more of the foundational techniques. This is when I first started using a sketchbook and took it everywhere I went. I couldn't draw enough! I began to develop my own sense of style and begin to express myself more openly. As I fell more in love with creating art I decided to audition for a high school where I could major in fine art and I was so excited to find out I had been accepted! My highschool [sic] art classes gave me a strong foundation to build upon and I soaked everything up! I also used to love going to bookstores and libraries sitting in the art section for hours looking at all types of books on other artists continuing to draw in my sketchbook as I was inspired by the masters. By the time I was 17 I was becoming very prolific in creating artwork and knew creating art would be my life! Thinking of doing anything else sounded terrible. I was determined to prove [I] could be a full-time artist! My parents were a bit [nervous] about me wanting to pursue art full-time and thought I should go ahead and see if a gallery would be interested in showing my work. We found a gallery who said they would take a look and I fearfully but bravely brought my portfolio I made out of 2 yellow poster board sheets that were stapled together with my best work inside. they said they had not seen anything quite like it and were not sure how it would do but they were willing to try it out in their gallery! I was thrilled! This gave me new confidence and purpose to take creating art seriously. I received a call the first week and they said a piece of mine had sold and then the next week and the next! I couldn't believe it!!! I began making new work and trying to stay up on my schoolwork at the same time. The sales continued to increase and the gallery said I had become their best seller that first year selling over 125 paintings! [My] dream of being a full-time artist was coming true fast! I needed a real art studio to keep up and singed my lease on my own little office space when I was 18 years old just before graduating. It all seemed like it was too good to be true! That is how I began truly making art. I also made a decision that since I knew I was made to be a painter that I would go out into the world and learn by experience and follow my heart for the next steps to take rather than go off to college. My parents did not think this was a smart idea and many others did not either but I knew deep in my heart it was what I was supposed to do and I'm so glad I stuck to it! JM: I was first drawn to painting by watching my grandmother draw and paint. She just did it occasionally for fun. 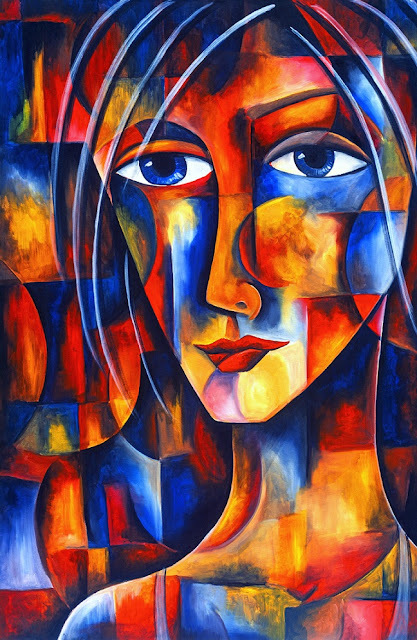 I was in awe as I watched what looked like scribbles on a blank sheet turn into a beautiful woman. I had a very active imagination myself and I had to learn how to do this. I was naturally creative and drawn to the arts. I felt a special peace and focus when I would experiment using various art supplies as a child. As [I] became more interested in art through Jr. High and the beginning of high school I mainly used pencil and charcoal. Starting off with black and white [sic]. I loved using my fingers to shade and blend watching things come to life with images seeming to pop off the sheet! I loved the simplicity of just using black. As I learned more about color and grew in my confidence I fell in love with chalk pastels and using workable fixative to build layers. I learned so much as I watched the color blend into each other and loved how complimentary colors next to each other would make my eyes dance in a sense. I think this is where my distinctive use of color began. I found I liked everything with strong contrast and the bolder and brighter the better! I was introduced to painting later on in high school and liked the permanence and the ability to create layers. Everything could be more precise and again there was an awesome magic seeing the colors come to life as they were carefully blended together on the canvas. I would go back and forth between using oil and acrylic. Today I mainly work with acrylic because I like to paint quickly so I love the quick drying time. I also enjoy experimenting with incorporating collage into my work along with pencil, fabric paint, oil pastel, and charcoal. I just incorporate bits of it sometimes to create more of an aged, raw, or less finished look. It can be so much fun to spontaneously try things out as I am working. On a different note of why I got into painting or creating art is that I love how I can express myself and share messages through the art. I am not much of a talker so art has always been an awesome freeing way to communicate, vent, and share my heart in a way others can relate to. I also love that art can be understood by anybody no matter where they come from or what language they speak. I have had people actually begin to cry as they looked at a particular painting because it so deeply touched them and to me that is the type of thing that keeps me excited to paint! To know people's lives can be touched, walls can come down and conversations can be started all because of art. It proves to me art has a great purpose and is not just a pretty decoration. JM: I was first inspired by Salvador Dali because he let himself be free to paint odd exaggerated things coming from his imagination. He didn't seem to care what people thought and took pleasure in being his own unique self. I often felt misunderstood and weird so his work helped me to be confident in letting my imagination run wild and not be concerned about what people thought. Picasso is another artist who has been a great inspiration. I love his boldness in color and line, plus his willingness to experiment and change in his style over the years. I felt he would let the emotion and character of a person dictate how a person was portrayed in his work rather than painting them as they are in the natural. I have also been inspired by how his work is very abstract but still representative of a particular subject and tells a story. I appreciate that balance. Frida Kahlo is another favorite! She was such a strong woman. I love her life story and her strength of character as she suffered physically and found her voice as an artist. To be vulnerable and transparent enough to openly share her pain and struggles on the canvas for all to see. I am also inspired by observing all that's going on around me and looking for the deeper meaning or simply celebrating the moment; finding beauty and hope where there seems to be none! I also love to write in my journal about whatever comes to mind whether goals, dreams, fears, doubts, struggles, life lessons or hearing something God puts on my heart that often turn into visions as I write which often turn into my paintings. JM: I hope it makes them smile! I hope it would lead them to think of deeper things in life. I hope that they would feel love and get a positive encouraging message. I want my paintings to share purpose, strength, encouragement, Faith, but love most of all! I should mention This was not always the case! In my earlier days my work was fairly dark and angry. While I loved to paint I couldn't see the purpose for being alive and went through some very tough years. I actually hated anything to do with hearts or happy "lovey dovey" stuff but my life was radically changed by the supernatural love of God and my work changed dramatically as well! My love for God and what he's done in my life is a huge inspiration for me so I also hope my work may show others the amazing love God has for them just as they are. As I openly share my experiences and things I am learning on the canvas I would hope others can relate and know they are not alone in whatever they are going through.